Being at the forefront of Pakistan’s data revolution, country’s largest data network, Zong 4G, has announced an un-paralleled offer for its data users. Customers can now enjoy unlimited access to world’s largest connectivity platform, WhatsApp, at Pakistan’s largest data network, Zong 4G, for absolutely no charge. Powered by the fastest 4G network in the country, Zong continues to balance affordability with seamless connectivity, as it continues to expand its 4G data coverage to all corners of Pakistan. This year, Zong has made some major announcements that are poised to transform the industry landscape. The company is expanding its 4G footprint to all of Pakistan, making 100% of its network 4G enabled. Zong’s management has also recently stated that “all Pakistanis are our customers” displaying a far-sighted approach that transcends the traditional boundaries of subscribership. 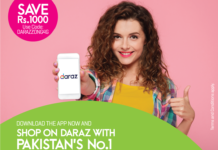 Zong 4G’s partnerships with some of the most widely accessed platforms in Pakistan such as Facebook, WhatsApp & Daraz, reflects its core desire to seamlessly integrate all subscriber preferred applications into its state-of-the-art, high quality network, for the best & most optimal user experience. Through its relentless focus on customer-centricity, Zong 4G continues to build its network and services around the unique requirements of its subscribers. This is also reflected by the fact that more than 70% of 4G users in Pakistan prefer to use Zong 4G’s super-fast network.